I love how everyone I know has some amazing childhood memory of camping. Sleeping in tents, being one with nature, hiking, cooking outdoors, building campfires, and of course, having their first s’more. It’s this iconic time when growing up that everyone seems to go through. Trying to make that marshmallow not catch on fire, until it’s perfectly toasted. Investing time into the making of this perfect fireside treat, and finally biting into the most delicious, satisfying dessert sandwich in all of time. Well, people, I never really had that experience. I made my first s’more in the microwave. Indoors. The air conditioning was on. And I went to watch TV immediately thereafter. I didn’t even toast the marshmallow. My mom had found these new, premade cookies in the grocery store called “Suddenly S’mores!” and bought them for us. 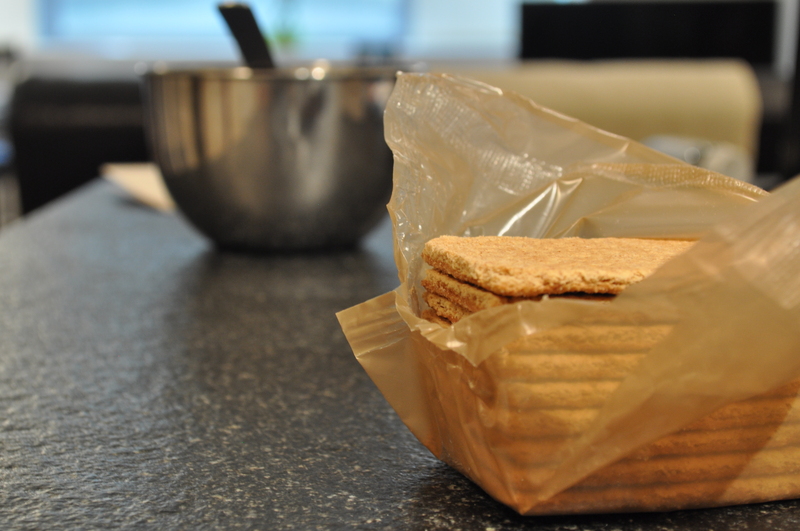 They came individually wrapped with these soft graham cracker cookies lined with a hardened chocolate glaze, with a marshmallow that expanded in the microwave. And in just 30 seconds, you had this gooey treat that, quite honestly, tasted pretty amazing if you didn’t know the difference. And it’s also the same ones that are in this ice cream and therefore the most perfect way to kick off the start of the summer this weekend. 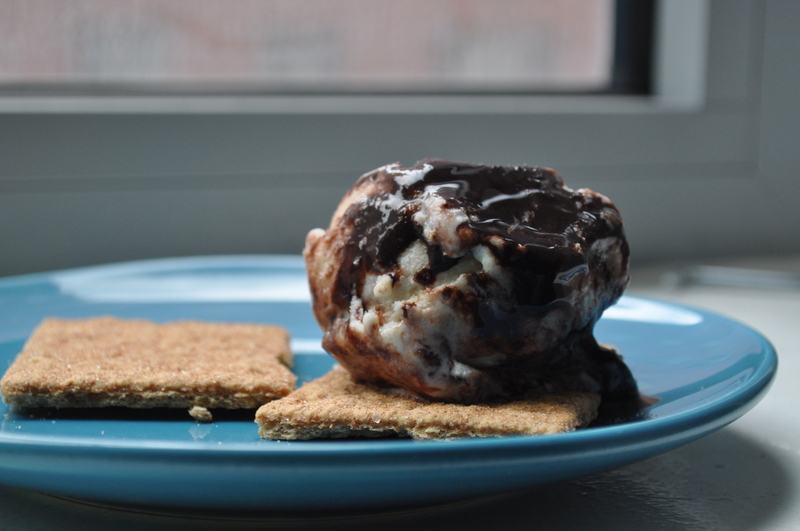 It may not be time for camping out just quite yet, but in case you are like me and want a s’mores treat in the comfort of your own house, this may be the exact way to go. 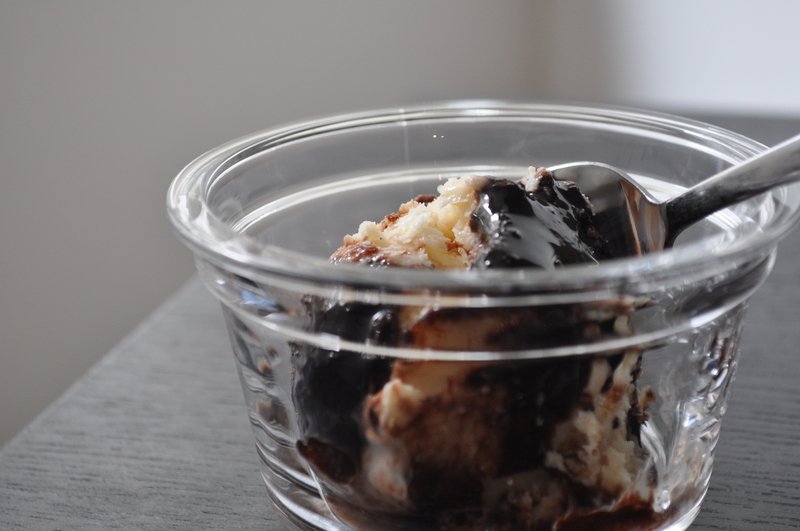 I made a chocolate sauce to be swirled into the toasted marshmallow ice cream, but I think the chocolate chunks would actually work a lot better, and the method I put in the recipe below. 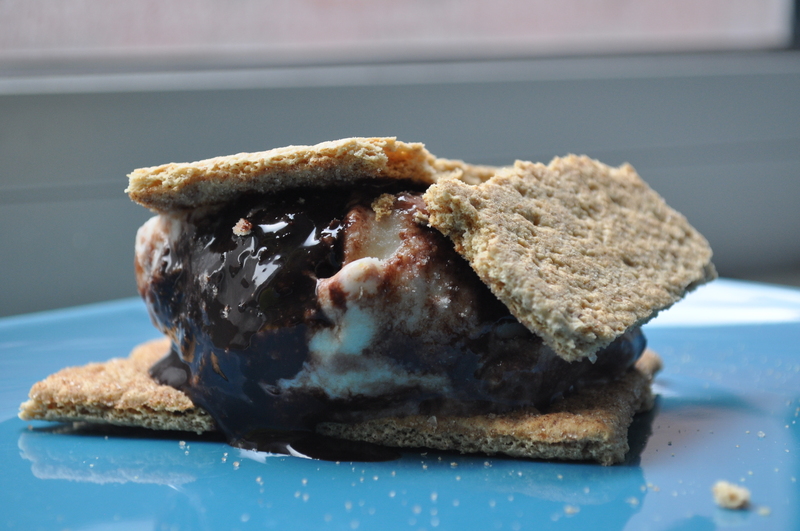 The hot fudge sometimes overpowered the rest of the ice cream, which isn’t bad, necessarily, but also isn’t s’mores. If you would like to make it that way, though, follow the link above – I followed those directions for the chocolate sauce directly. Also, to note, the graham cracker pieces do get a bit soggy in the ice cream. This is just fine with me, but another way to go about this is coating the graham crackers with the chocolate, let it harden, and then mixing them into the ice cream base. That is what I call the most delicious protection ever. Also. Apologies for the number of ice creams I have been posting. But isn’t it that time of year? Place an oven rack at the top of the oven, and preheat the broiler. Spread the marshmallows in a single layer on a parchment-lined baking sheet. Place the baking sheet under the broiler for 30 seconds to 1 minute, or until toasted (turn on the light and watch them the entire time – you don’t want them to catch on fire!). Once toasted, take them out, flip them, and put them back in the oven for the same amount of time so the other side can get toasted. 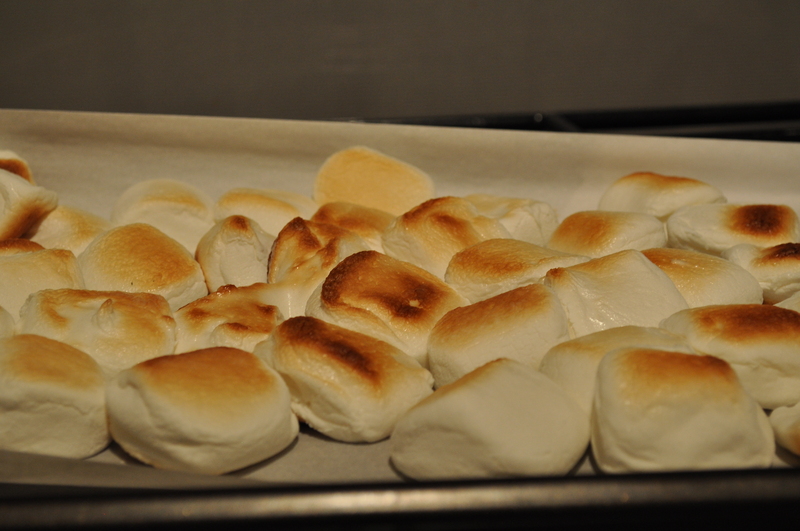 Pull the baking sheet out of the oven, turn off the oven, and let the marshmallows cool to room temperature. In a large pot, mix together the milk, cream, vanilla (only if using the bean or bean paste), sugar and salt. Whisk together and put on stovetop, over medium heat until the mixture is just under a boil, and scalded. Take off the heat, and if using vanilla extract, whisk it in. Allow to cool slightly, about 15 minutes. Place the cooled marshmallows in a large bowl. Pour the warm milk mixture over marshmallows and let it sit for a minute. Whisk together to break up the marshmallows and the mixture is as smooth as you can get it. Allow it to come to room temperature, and then place in the refrigerator until it is completely cold – a minimum of 4 hours. Follow your ice cream maker’s instructions to churn the ice cream. Alternatively, if you don’t have an ice cream maker, you can follow these instructions. After it’s done churning, throw in the chocolate and graham crackers and mix with a rubber spatula until evenly distributed. Place in a container in the freezer until it’s completely frozen. This entry was posted on	May 23, 2013 at 9:18 am	and is filed under Uncategorized.